Medieval worship was an important part of medieval life not only in England but throughout Europe. In the early 12th century church windows were generally small and made of clear glass. The next development was glass satined in greys and blacks - known as grisaille. However the development of the Gothic arch allowed larger windows to be built which led to the French introducing stained glass as we know it today. Towards the end of the 12th century stained glass windows began to appear in churches and priories in England and other countries. Perhaps the best example of medieval stained glass in England today can be seen in Canterbury Cathedral dating from around 1180. For a wonderful list of countries and their churches where medieval stained glass can be seen click here. At Lanercost Priory in Cumbria, it is a little different and indeed unusual ... the priory is of course medieval having played host to King Edward I in the winter of 1306. 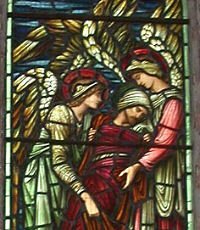 However, its stained glass windows are famous not for being medieval but for being designed by Sir Edward Burne-Jones, one of the great English Pre-Raphaelite artists who became involved in the rejuvenation of the tradition of stained glass art in England during his lifetime. A friend of the aristocrat and artist George Howard at Naworth Castle near Lanercost Priory, Burne-Jones also create some wonderful stained glass windows for St Martin's Church in nearby Brampton as well as for Birmingham Cathedral.